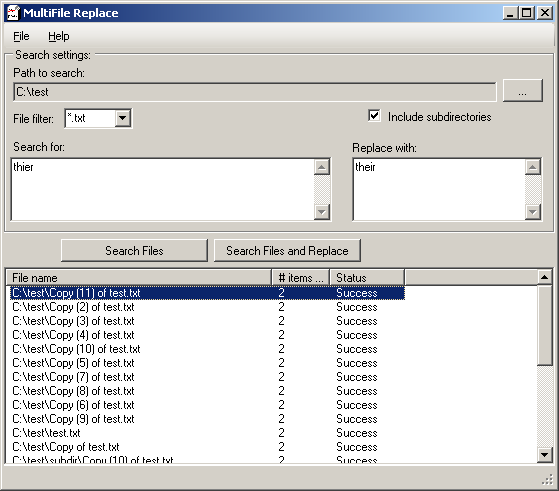 MultiFile Replace allows you to scan a directory (and sub-directories) to find and replace words or phrases. It is great for updating web sites with static pages if a link changes or to update the copyright information if you have changed the content of those pages. Case sensitive support added in version 0.1.2. MultiFile Replace requires the the Microsoft .NET 2.0 framework installed on your system. You can download it from Microsoft’s website, or through Windows Updates. For Linux systems, you will need Wine with Mono. Tested Operating Systems: Windows 2000, Windows XP, Windows Vista, Windows 7, Windows 10, Xubuntu 16.10. What do you think about MultiFile Replace? Rate it!